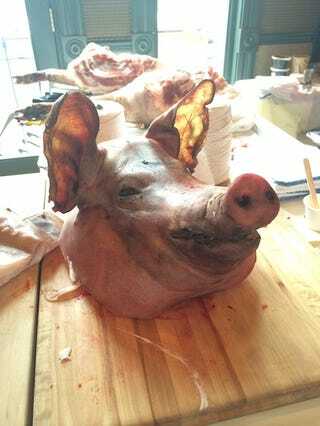 Runway Food Run Amok: Crowning Aspen's "King Of Porc"
After about 90 minutes at Grand Cochon in Aspen, Colorado, it all starts going to your head. Whether it's a function of being crowded into a century-old ballroom with hundreds of others at an altitude of 8,000 feet, the cumulative effect of spending three days treating wine as one of the four main food groups, or the two pounds of pork now filling your stomach, at some point the air thins even further, and the beads of sweat begin creeping along your hairline. But then you top off your wine glass with a Chilean red, wipe your brow, notice the Cuban sandwich on a stick being offered in the corner, and fight on. Last month, Drew Magary wrote about runway food —unique culinary feats designed to impress a small, elite group but never intended for mass consumers, akin to clothes that dot fashion runways but never make the sales rack at your local Macy's. Stretch that analogy further and Aspen's annual Food & Wine Classic becomes the food world's Paris Fashion Week. Industry insiders and the wealthy fly to one of the most beautiful and exclusive cities in the U.S. to spend three days eating, drinking, and debating the very best and latest developments in food and drink, all for the bargain basement price of $1,250-$1,350 per person (or as I call it, "a mortgage payment"). Driving into Aspen on the eve of this year's event (held last weekend), you passed the small airport where private planes stack up like an interstate at rush hour, one plane with a drawing of an oil derrick on its tail, another emblazoned with the helmet of the NFL team based in Washington, D.C., if you need further illustration of the clientele here. I can't confirm Daniel Snyder was in attendance, but it makes perfect sense, especially if he attended the "Wines for IPO Millionaires" seminar, where he could've walked away with a button reading, "I drink wine from the '70s. The 1870s." All weekend, the streets of Aspen swarmed with the well-to-do in their pastel button-up shirts and ever-present yellow lanyards announcing their place among the anointed. Surrounded by mountains for hiking and biking (or streams for fishing and rafting), their biggest exertion is instead sitting in open-air patios under the cloudless blue sky, excitedly describing how they freaked out while photo-bombing chef José Andrés. But if all this constitutes the food world's Fashion Week, Grand Cochon, held on the event's closing Sunday, is the runway show of a young, hip designer specializing in sustainable fabrics. In place of hemp skirts, though, are piles of responsibly raised, heritage pork, with up-and-coming chefs vying to rule over that pork as though a god. Originally started in 2008 by founder Brady Lowe to raise awareness of alternatives to industrial meat production, Grand Cochon (it's French for "pig") is the culmination of the 10-city Cochon 555 tour, where five local chefs compete to create the best pork-centric dish from specially raised heritage-breed pigs. The winner of each city then travels to Aspen to compete for the title of The King/Queen of Porc. (Porc taken from the Catalan.) On the heels of the Classic, attending Grand Cochon is a steal at $150-200 per person. The event fills the tight, antique ballroom of Aspen's Hotel Jerome—famous as both one of the West's oldest luxury hotels and a prominent setting in Dumb & Dumber. The 600 guests crowd tables covered with bottles of booze and the pork-centric offerings of the 10 chefs; each chef offers three dishes, so the hardiest of visitors will sample 30 pork dishes over the course of two hours. Not to mention the various alternative offerings of salumis, cheeses, and oysters also available. After gorging, each guest can cast a ballot for their favorite dish, and then go pass out in a luxury hotel room or something. For the chefs, Grand Cochon is at best a working vacation. Jennifer Jasinski represented Denver in Aspen; mentored by Wolfgang Puck and with a Top Chef Masters appearance to her name, she represents the new guard of chefs, as comfortable in the public eye as over a hot grill. This was Jasinki's second attempt at being crowned the Queen of Porc, having lost in the 2011 Denver preliminary competition. Despite admitting it is a lot of work, she returns for two reasons: to drum up publicity for her restaurants—"There is a lot of national exposure to it"—and to "get to cook and work with a lot of really cool chefs from around the country." I can neither confirm nor deny that her spicy posole got my vote as the best dish of the night, but after months of tinkering, all her Cochon-specific dishes now go back on the shelf: She has no plans to add them to any of her menus. ("Maybe the posole when cold weather returns.") While the guests relaxed all day and arrived at 3 p.m. ready to eat, drink, and get bloated, Jasinski's team spent all day prepping, a 12-hour workday yielding dishes eaten in moments by the guests that crowd her table, only to immediately turn tail and crowd someone else's. Her reward for this work: a trip back to Denver early Monday morning to continue preparing to open her fourth restaurant, Stoic & Genuine, in less than three weeks. That, and maybe a little post-competition bourbon. Meanwhile, as the chefs compete through hard work and creativity, guests merely practice gluttony and patience: Stand in line, inhale pork paella. Fill wine glass. Stand in line, receive a spoonful of foie gras, then a plate of pork ramen and a pork bun. Wash, rinse, repeat. Shredded pork tacos, wine, a pork sushi roll, bourbon, pork taco in a shell made of pork rinds, beer, blood sausage, cider, bacon jam cake. Slowly, the stained paper bowls, dirty plates, and wooden utensils merge into a single, indistinct monument to consumed pork. Or maybe my eyes were blurring. I tapped out after sampling eight of the 10 chefs' offerings. Feeling guilty for walking away from such luxurious offerings—but beyond the point where food and pleasure could be anything more than passing strangers in my stomach—seems to reflect the contradiction inherent in events like Cochon and the Classic. For someone that loves food, it is fun to taste new, exciting, and apparently ephemeral dishes while meeting people better at cooking than I could ever hope to be. But at the same time, the very nature of the event comes with at least some level of remorse. Is battling others for the privilege of quickly inhaling opulent food really a reasonable use of $200? My vote cast and my stomach churning, I went out to get some air. In the J Bar at the front of the hotel, where Hunter S. Thompson once ran for Pitkin County Sheriff, dozens gathered around TVs watching the U.S./Portugal World Cup soccer game. I pulled myself away with 15 minutes left on the clock in Manaus, arriving back in the Ballroom just in time to see Ray Garcia of Santa Monica's Fig Restaurant named the 2014 King of Porc, thanks in part to his spicy Chilaquiles of pork belly, head, blood, and organs. As the rest of the country was punched in the gut by that fateful last-second goal by Portugal, the newly crowned King of Porc was awarded a crown, a slug of bourbon, and a trip to Spain. Standing on the elevated stage and receiving the adulation of the assembled crowd, he bore more than a passing resemblance to a fashion designer receiving accolades at the wrap of his spring show. David McIntire (@PFBSuperDave) lives in Denver. His book on a season spent betting football in Las Vegas, Swimming with the Sharps, is available now. Lead photo by author; all other pics by Galdones Photography/Cochon 555.